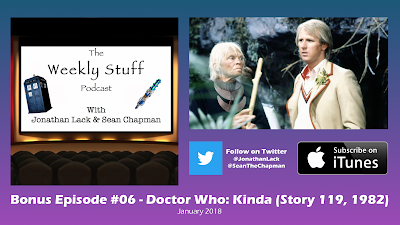 After two wonderful months spent chronicling the adventures of the Fourth Doctor, we jump ahead to the strange reign of the Fifth, played by Peter Davison, and the rocky tenure of producer John Nathan Turner. Kinda, the story we discuss here, is the Fifth Doctor’s third-ever serial, and it is one of the weirdest, wildest, and most unique Doctor Who stories ever told, steeped in dream sequences, surreal imagery, and bizarre plotting that, at the very least, adds up to an extremely memorable story. Is there more than just wackiness on display here? What do we make of Davison’s performance as the Fifth Doctor? And is Adric or Tegan a worse companion? We answer all these questions and more in our in-depth discussion of Kinda. The Denver Film Critics Society, of which I am a voting member, has today announced its winners in our 2017 film awards. I wrote about the nominations when they were announced last week, and was very happy with our batch of potential winners. The final victors, which you can read about below, are a pretty damn strong group as well. 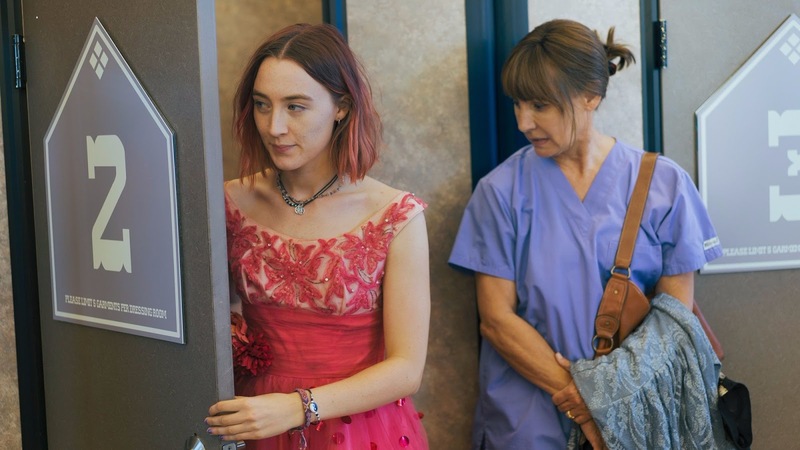 Our Best Picture award went to Lady Bird, my favorite film of the year, while Best Director went to Christopher Nolan for Dunkirk (I would have preferred this one go to Greta Gerwig, but Dunkirk is an obvious and extraordinary directorial achievement and I cannot fault his win here). Lady Bird also won Best Actress for the wonderful Saoirse Ronan, while Best Actor went to Gary Oldman’s transformative performance in Darkest Hour (I’ll pour one out for the great Harry Dean Stanton, who made our nominations but didn’t win in the competitive field). Supporting Actor wins went to Willem Dafoe and Allison Janney, while screenplay fields split between Jordan Peele’s original Get Out and James Ivory’s adaptation of Call Me By Your Name. 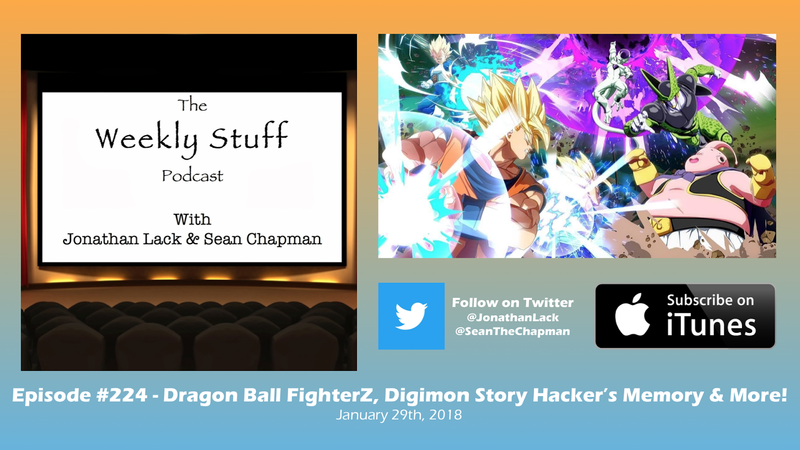 It’s a grab-bag style episode this week, as we cover a week’s worth of news items, including Thursday’s Nintendo Direct announcements, Sean reviews the beta for upcoming fighting game Dragon Ball FighterZ, and Jonathan talks about finally catching up on Pokken Tournament DX for Nintendo Switch. And for our main topic, we preview what’s to come in 2018 in terms of video games, looking at the confirmed games for Spring and discussing what we plan to play and review, and speculating about which games will and won’t come out through the rest of the year. We even play a silly game where we ‘draft’ which games we think won’t make speculated 2018 release dates, just for fun. Enjoy, and come back for our next Doctor Who bonus podcast this Thursday! Yesterday, the Denver Film Critics Society, of which I am a voting member, announced its awards nominations for our picks in cinema’s best for 2017. There were, as I wrote about with my Top 10 list, an extraordinary number of great films this year, and that has translated to the best group of nominations we have ever had in my years voting with the organization. And I don’t just say that because a surprising number of my pet nominees made it in – I say it because this is an unusually rich awards season that it starting to coalesce in very frustrating, exclusionary ways, and I think our nominations do a relatively good job celebrating the scope, diversity, and totality of the year in film. We’re still missing some crucial categories (like Cinematography, which I lobbied for and got added in 2015, only to see it subsequently removed), and everyone will have nitpicks here and there, but I think on the whole this is a group of nominees we can all be proud of. 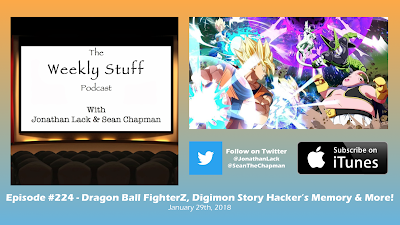 We will be voting later this week for the final winners, which will be announced next week, and I am very excited to see who and what comes out on top. The Weekly Stuff Podcast #221 – Holiday Stories, Doctor Who Christmas Special Review & More! 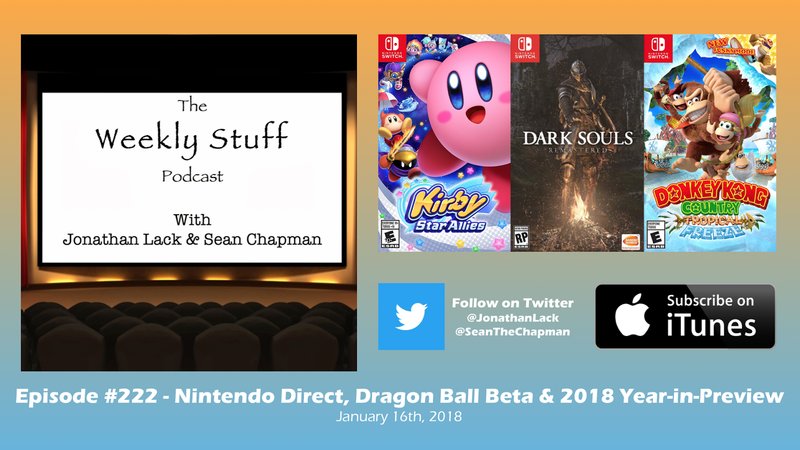 For our first show back in the new year, we clear the deck with hours of holiday stories, reviews, and chats about games old and new we’ve been playing over the break. Sean talks about his Christmas at sea, with a mini-rant about a library on a cruise ship, while Jonathan reviews some Blu-rays he received as presents, including Twin Peaks: The Return and the new Doctor Who: Shada reconstruction. 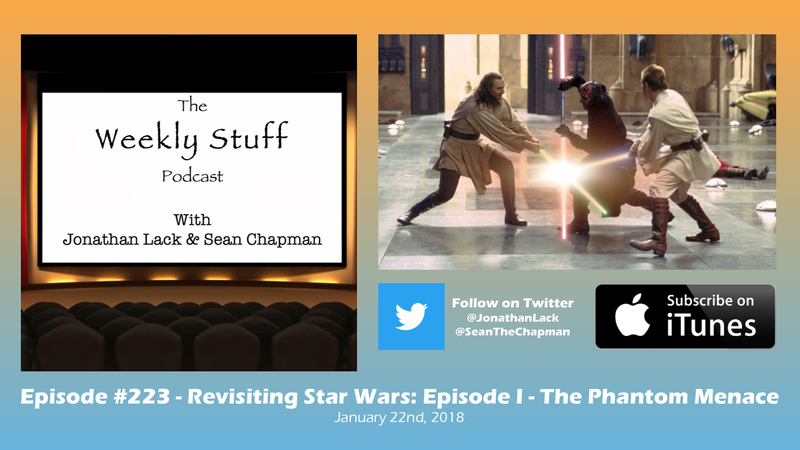 Sean talks about playing Assassin’s Creed Origins and revisiting Star Wars Jedi Knight II, while Jonathan recounts his weird tradition of playing Papers Please every Christmas, and his journey diving back into the Batman: Arkham series. 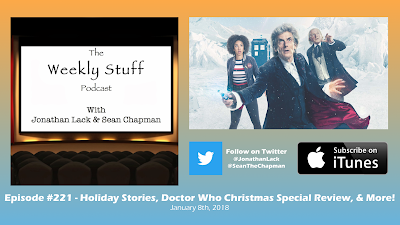 We cover a few quick pieces of news, and then for our main topic review this year’s Doctor Who Christmas Special, “Twice Upon a Time,” the last episode written by Steven Moffat and starring Peter Capaldi. It’s the end of the wonderful era, and the start of something very exciting, and we have, as is our wont, a lot to say on the subject.